Thank you for purchasing a Pakayak product – we hope you’ll love it! Inspect the box for all parts. 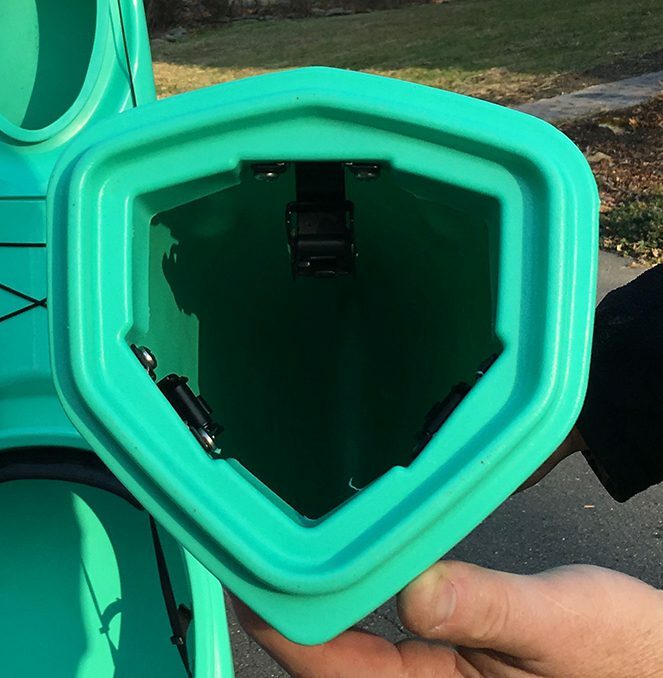 There should be a bag with 6 kayak parts, a seat and a towel. If anything is missing, please contact us right away. In case you want or need to return your Pakayak product, it will need to be in the original box with all the packing. So please keep your box until you have tried your Pakayak product. 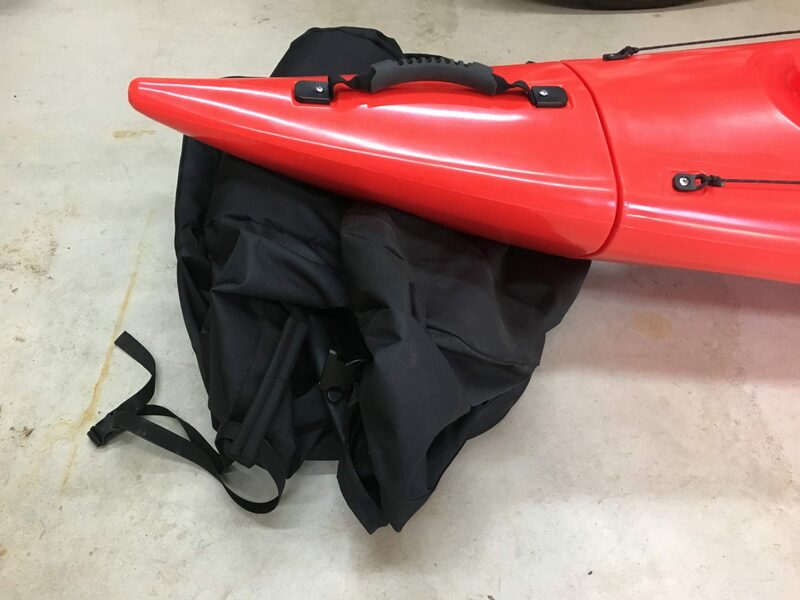 We recommend that you assemble your Pakayak on a carpeted surface inside or on a soft surface (like a blanket on the grass) and test out the fit before you try it in the water. When you test it in the water, carefully set it in the water and be sure not to rub or drag it against any rough surfaces. 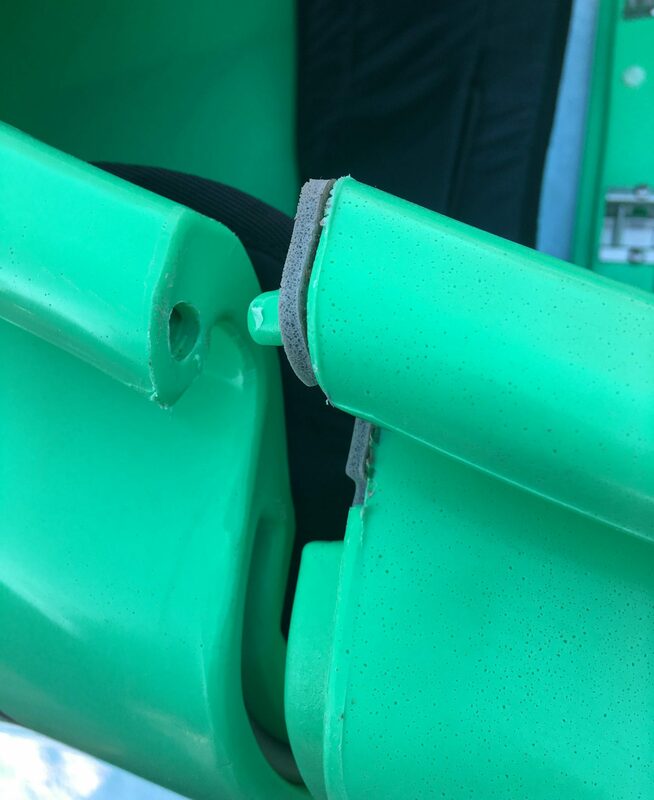 If your Pakayak product is scratched or gouged, it will not be eligible for return and refund. 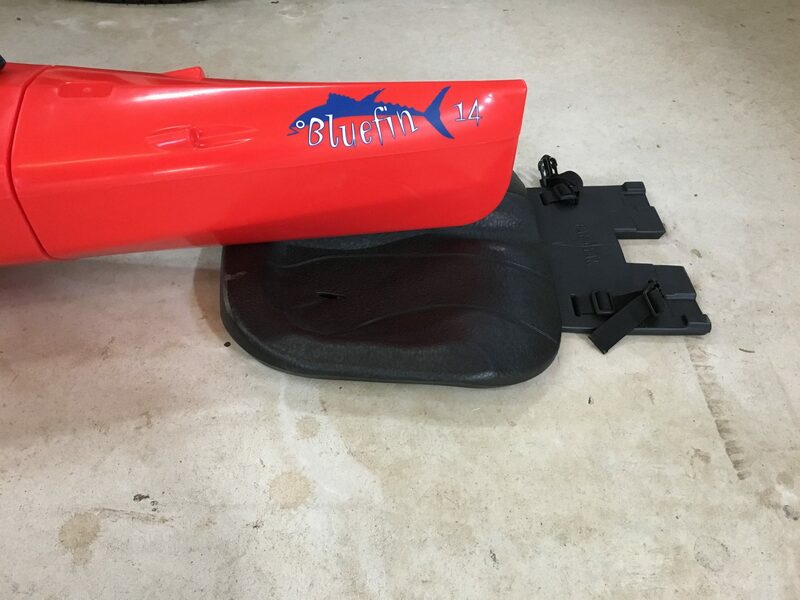 First, watch how to assemble your Bluefin 14, then head right on to see how to unlatch and pack your ‘yak. We also provide you with some clamping tips below. That should set you on the right track and get you out on the water. When you get a minute, head on back to the PAK Members page and get to know your boat, download the Owner’s Manual and check out other tips and tricks to better familiarize yourself with the boat. And, don’t forget to register your boat! The clamps in this boat are very strong to ensure a watertight seal. Some of you may find the clamps hard to open and close at first because the gaskets are brand new and require a bit of a break-in period. 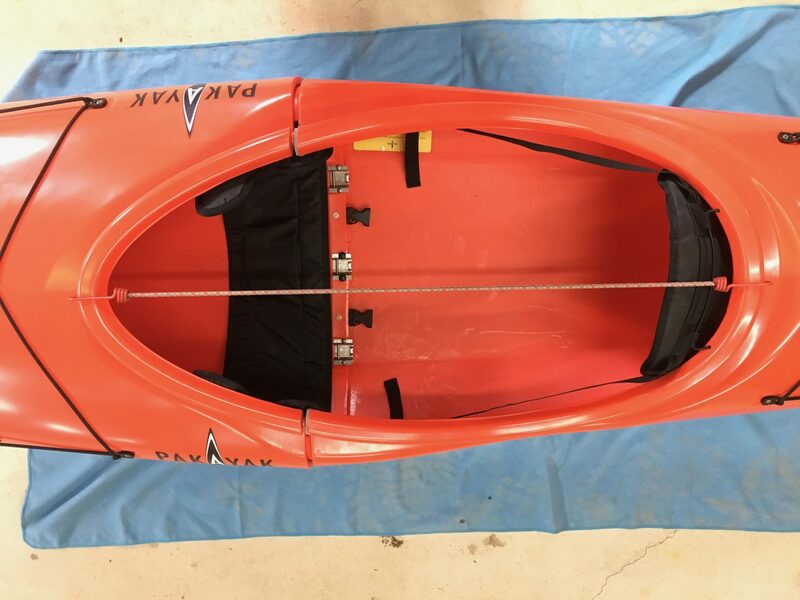 After the first few times you clamp your Pakayak together, it’ll get easier. LATCHING: When latching the clamp, rotate the lever until it’s in contact with the rounded black band, then push the lever completely onto the pin before latching. LOOK: Take a look at the clamp locations in the bow and stern sections (1 and 6) before clamping as they are hard to see once in place. UNLOCKING: When unlatching, the thumb latch does NOT need to be moved much. Slightly push it back then pull up on the lever. Maintain a firm grip on the lever to control the spring release. UNLATCHING: When unlatching, brace your hand against the inside of the boat whenever possible. 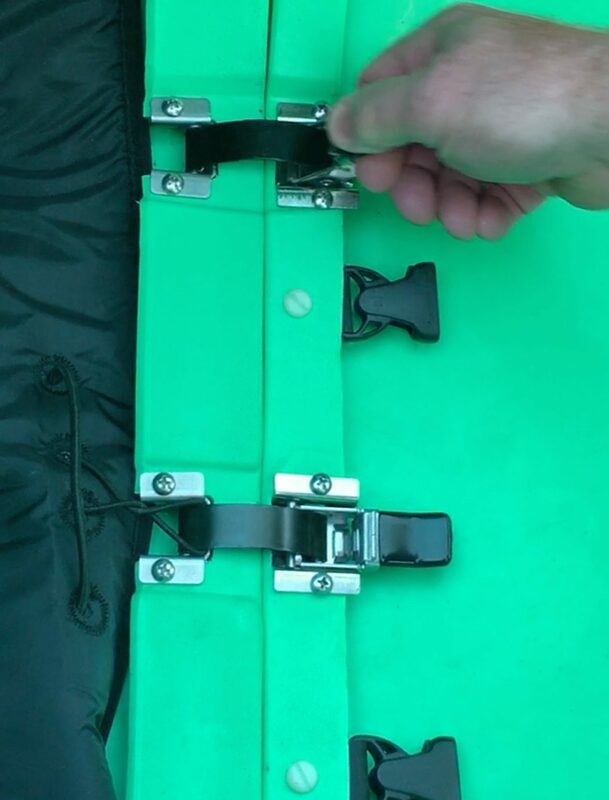 For the top clamp in section 1 & 6, brace your forearm on the inside of the hatch area for leverage. TENDER HANDS: For those with tender hands, you might want to wear gloves the first time you assemble. Once you have latched the clamps a couple of times, it’ll get easier. LIFT ENDS: To help bring the cockpit together, place the bag under the bow and the seat under the stern. Then latch the middle clamp first and work your way out and up to the cockpit rim. 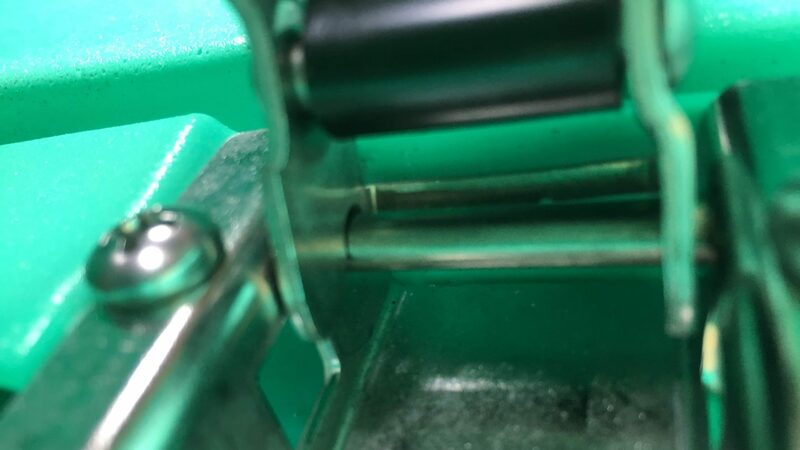 Make sure the pins are lined up with and fit inside the receiving holes. Place bag under bow to line up cockpit sections. Place seat under stern to line up cockpit sections. Make sure pin is lined up and goes into receiving hole. BUNGEE: To help pull cockpit together, use a bungee. 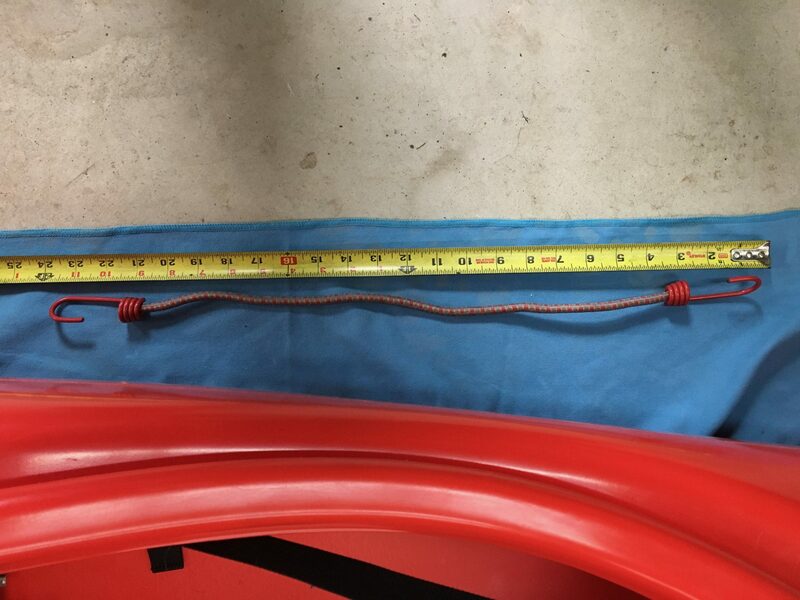 We find a 24″ bungee works great. Pull cockpit together with bungee. LEVERAGE: Remember, it’s all about leverage and control. To keep the clamp from springing out of your grip, hold firmly and use leverage.